Google lets anyone make a play for your clients. Anybody can advertise their business when someone searches Google for your business. A competitor or even an angry customer can show an advert when someone searches for your business by name. Take a look at the screenshot below of a search for the Villa Rosa guest house in Cape Town. I’ve searched for it by name in the same way a returning guest or referral might. 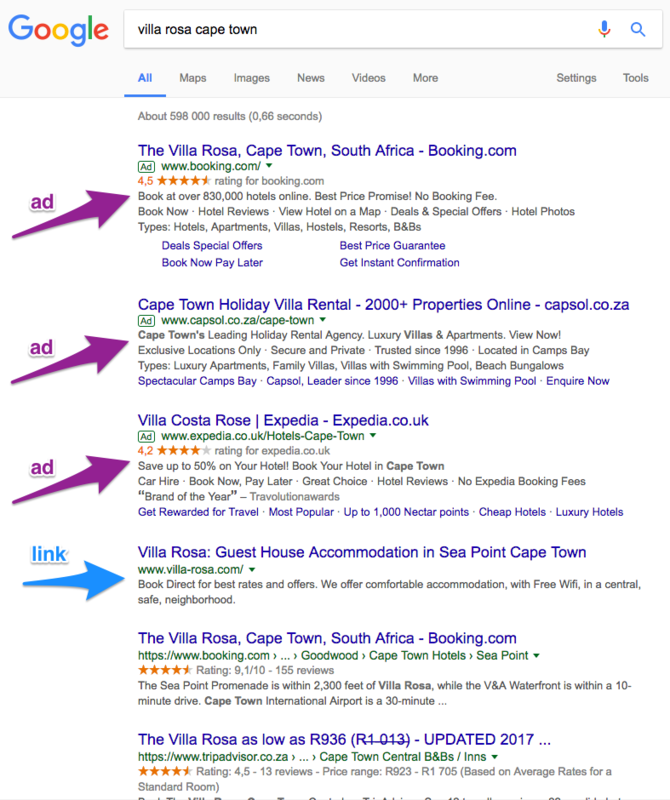 booking.com, capsol.co.za and expedia.co.uk have asked Google to show their ads when someone searches for the Villa Rosa. The link to the Villa Rosa website is buried below their ads. It’s invisible without scrolling on a smaller screen or mobile phone. Anyone clicking one of the ads would land on a site listing the Villa Rosa alongside their competition. Even if the Villa Rosa won the booking they’d have to pay a commission to the site where the booking was made. Compare that with how the makers of Camtasia video editing software defend their territory. Here’s a screenshot I took a while ago. 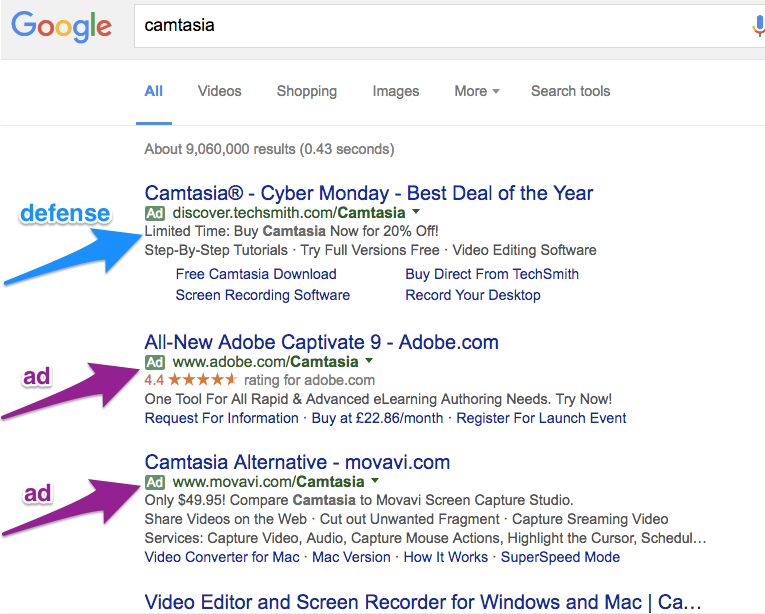 Adobe and Movavi are trying to syphon off some of the people looking for Camtasia by advertising on searches for Camtasia. Camtasia defends by putting their ad right at the top of the page even though the direct link to their website isn’t too far down. Most people click the first link they see when they search Google. If you don’t defend that first spot you risk losing important website visitors - the ones who are looking for you by name. Even if your website is first in line today it'll be buried the minute your competition, a review site, or an angry customer asks Google to show an advert. How much does a defensive AdWords campaign cost? Building the campaign. This is a once-off cost. It includes setting up an AdWords account, keyword research, writing ads etc. Your investment is $398.75. Paying Google. Google charges every time someone clicks your defensive advert and lands on your website. For most smaller businesses this doesn’t cost very much. You decide how much you’re prepared to spend every month. You’ll pay Google directly, by credit card. We’ll set this up for you. Managing the campaign. The campaign needs attention or it starts to cost more and deliver less. We charge $455.88 a year to make sure the money you get the best possible value from the money you spend on Google. Contact us using the form below to get started. Disclaimer: We have no relationship with any of the businesses listed in the screenshots. All screenshots © 2015 Google Inc, used with permission. Google, AdWords and the Google logo are registered trademarks of Google Inc.